Every interesting thing aims to provide your character with an object, experience, or situation to help make him or her unique. When you would gain an interesting thing, you can use the tables presented in Oddities, Artifacts, and Esoterica in place of those found in Shadow of the Demon Lord. If so, first roll a d20 to determine the type of interesting thing, which then directs you to the table or tables you use to determine the form your interesting thing takes. 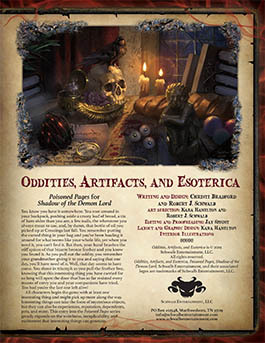 Pick up Oddities, Artifacts, and Esoterica in PDF today from Schwalb Entertainment or DriveThruRPG! With the world crumbling into ruin and chaos, and reality itself teetering on the brink of utter oblivion, there are those who find the temptation to embrace the darkness almost irresistible. After all, they will argue, if everything is hurtling toward annihilation, why shouldn’t we all indulge every desire and engage in whatever acts we choose, no matter how wrong or evil, without fear or care of what might come? 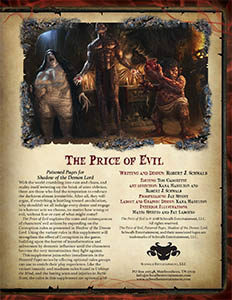 The Price of Evil explores the costs and consequences of characters’ evil actions by expanding on the Corruption rules as presented in Shadow of the Demon Lord. Using the variant rules in this supplement will strengthen the effect of Corruption in the game, building upon the horror of transformation and subversion by demonic influence until the characters become the very monstrosities they fight against. 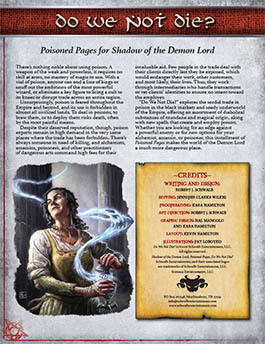 This supplement joins other installments in the Poisoned Pages series by offering optional rules groups can use to enrich their play experience. Like the variant insanity and madness rules found in Unhinge the Mind, and the lasting scars and injuries in Battle Scars, the rules in this supplement are optional and should only be used if all the players and the GM are in agreement to incorporate them. 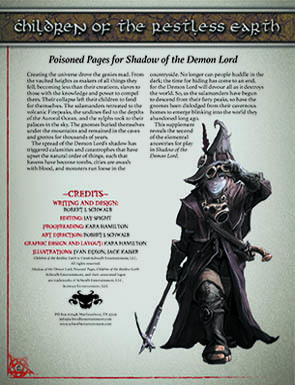 Utilizing these variant rules brings the story element of the Demon Lord’s shadow even more forward as an active and terrifying force that can both aid and hinder the story’s protagonists. Buy the PDF of The Price of Evil from Schwalb Entertainment or DriveThruRPG! We all wear masks. We wear them to conceal our true selves, to become what others expect us to be, navigating the murky waters of social interaction to forge relationships, find love, and avoid enemies. For most of us, masks conceal uncertainties and doubts, ambitions and desires, and all the little secrets that make up what we think of as our true selves. For a few, masks conceal darkness, a dangerous beast just barely restrained by the chains of self-control. Sometimes, the chains break, the mask slips, and the horror begins. 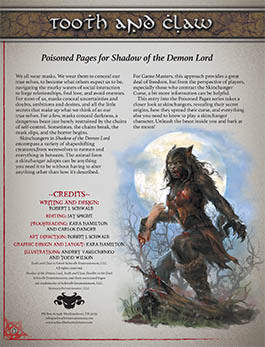 Skinchangers in Shadow of the Demon Lord encompass a variety of shapeshifting creatures,from werewolves to ratmen and everything in between. The animal form a skinchanger adopts can be anything you need it to be without having to alter anything other than how it’s described. For Game Masters, this approach provides a great deal of freedom, but from the perspective of players, especially those who contract the Skinchanger Curse, a bit more information can be helpful. This entry into the Poisoned Pages series takes a closer look at skinchangers, revealing their secret origins, how they spread their curse, and everything else you need to know to play a skinchanger character. Unleash the beast inside you and bark at the moon! Buy Tooth and Claw as a PDF from Schwalb Entertainment or DriveThruRPG!